The finish of black grill cloth and brushed metal sides makes the ABS one of the sharpest looking soundbars you could find, and at a little over a meter wide one of the more substantial. Yet it’s sleek design and narrow depth make it very room friendly. Included is a rubber base for shelf mounting or for wall mounting you can get an optional wall bracket for NZ$ 95. Alternatively the ABS will fit the Sanus™ VMA202 TV mounting system. Dimensions excluding rubber base – 180H x 1005 W x 167 D mm. The world loves streaming. It’s a delight to play your music from digital devices without fuss and hear tantalising uncompressed sound. 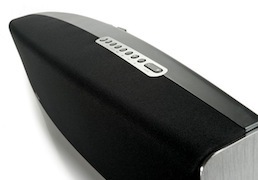 The ASB incorporates every current connection option – both direct and wireless, including the very latest versions of Apple AirPlay. The ‘Direct’ version of AirPlay allows wireless communication without needing a WiFi network in the actual room, hence your guests can stream from their own compatible devices. This also means that should you not have a wireless router but do have an iOS device you can still stream audio. The ASB will also play iTunes stored on PCs, Macs and other digital devices –the ASB is DLNA / UPnP enabled, (for Android/Windows phones); and stream from internet services. So you can play music any which way you choose. You can even plug in a CD player, or anything else for that matter! Read more on making the most of wireless in your home. The Monitor Audio ASB2 is simple and intuitive to operate. A remote control is supplied and top mounted buttons allow input selection, sound adjustment and standby. The ASB will play straight out of the box but an on screen menu allows you to easily customise the sound and operation of your ASB should you so desire – you’ll be pleased at how straight forward this is compared to home theatre receivers. Even the manual explains everything well. It’s nice to feel empowered when setting up a new piece of hi–tech electronics! Which brings us to us to connection options. Whilst the ASB is a single unit, easy to install, connect and use it is also extremely versatile. 3 HDMI inputs allows you to connect your choice of high definition sources such as a Bluray player, games console, set top box; an HDMI goes out to your TV and if you have an Audio Return Channel capable TV the single HDMI will do both picture and sound. Other inputs are a 'USB' which can also be used for software up–dates and setting up the wireless network; plus you have a 'Digital Coaxial' audio input, a 'Digital Optical' audio input and 2 auxiliary inputs – one RCA and one 3.5. So there’s plenty of flexibility for connecting multiple sources in a choice of ways. The ASB provides full sound which does not require a subwoofer but if you would like one there is an output for that too. So how does it sound? The sound is every bit as good as you would expect from Monitor Audio. Nothing missing in the nuances of music and all the subtle sounds that make movie watching an engrossing experience are effortlessly there. The power and control of bass is un-matched. Listening to the ASB one feels enveloped in the sound, and by virtue of this, the picture as well should you be viewing. The optional sound adjustments includes a '3D audio' which you can set on your on–screen menu or toggle on or off from the top mounted buttons. The 3D effects are great fun and really bring you into the movie soundscape. For 2 channel, the wider sound stage makes the ASB2 more than just an alternative to conventional speakers. With movie watching, you'll find you can adjust the virtual surround sound effect via the on screen menu. Also via the on screen menu you can further tweak with equalisation and channel levels. But even straight out of the box the ASB sounds spectacular with sound performance surprising all who hear it. What Hi-Fi? Sound & Vision agrees. Awarding a maximum five stars, its November issue just out says "The sense of drama and excitement is enhanced by the ASB-2's ability to communicate the film's score. This level of musicality is difficult to pull off in a soundbar." In the plus column, the magazine lists solid build, three HDMI inputs, AirPlay and DLNA, sensational sound quality and good bass. In the minus column: nothing! Is this the one to have? 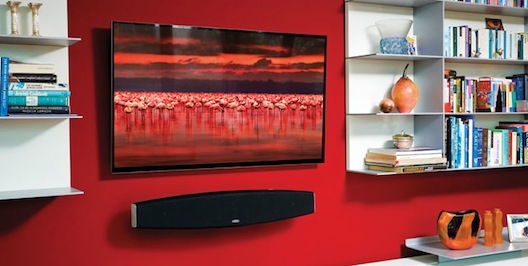 The ASB is truly a complete home entertainment system built for today᾿'s media rich environment. Until recently the solution for better TV sound would have been a surround sound system – if you have any personal experience with these you may well have found it complicated, with many speakers, connections and operation that proved far from intuitive. As these systems have become more 'mass market' the price has fallen but also quality has become increasingly compromised. In terms of other 'sound bars' we’ve researched all the comparable products including B&W, Sonos, Yamaha and Polk. The Monitor Audio ASB2 offers the highest level of performance and greatest connectivity, but is by no means the most costly. 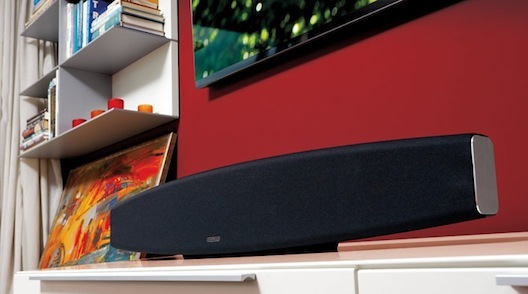 Unlike many it is a single full range speaker so no additional subwoofer is required. The six speakers and 160 watts via five discrete power amplifiers of the ASB2 casts clear, powerful sound in a room filling way. Three pivotal aspects of the technology behind the ASB sound performance are Monitor Audio’s proprietary C–Cam tweeters and drivers, the high spec Digital Signal processing and Digital to Analogue Converter. Why buy Monitor Audio from Totally Wired? The Monitor Audio 'ASB–2' is a new model from one of the UK’s biggest and best speaker designers and manufacturers. Monitor Audio have been innovators in speaker design for over 40 years and are going from strength to strength. There is a very straight forward reason why more and more people like you are choosing speakers from the Monitor Audio house. Quite simply they set very high standards yet remain realistically priced. There is no denying Monitor Audio’s success and the performance of their speakers, and the finish is always immaculate. We’ve sold the Monitor Audio speaker range for the last 10 years. They have domestic and in–built models, stereo and AV with a range from affordable ($500 a pair) right up to seriously high end products ($15,000 the pair). The ASB2 builds on this heritage and we believe would be a great enhancement to your life style – delivering both on the practical level but also addressing any existing perceptions of either compromised sound quality or value in choices made. Part of this is who you choose to purchase your ASB from. We hope you’ve enjoyed reading about the ASB and now have a good understanding of it. If so, you can feel safe in the knowledge that you are dealing with people who know and care about good quality audio, and the enjoyment you get from it. Talk to us to confirm that the Monitor Audio ASB is the perfect solution for you. 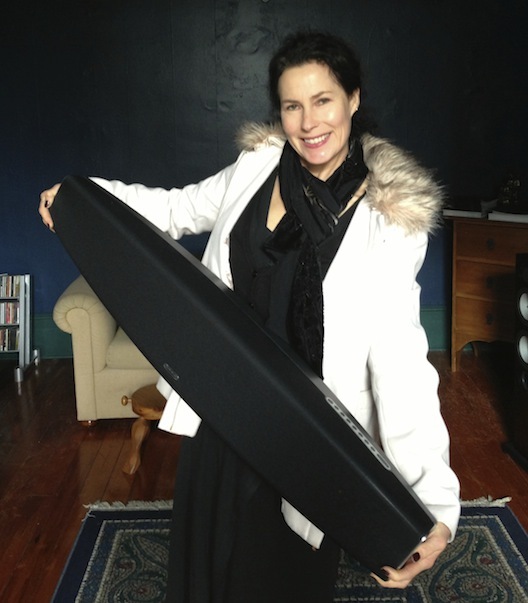 Visit Monitor Audio to read more about the ASB–2 Soundbar System.